In the chart above, you can see that during the majority of 2012 as the YEN was strong but began to weaken, capital flowed out of Japan. The securities most often purchased by Japanese residents were bonds. 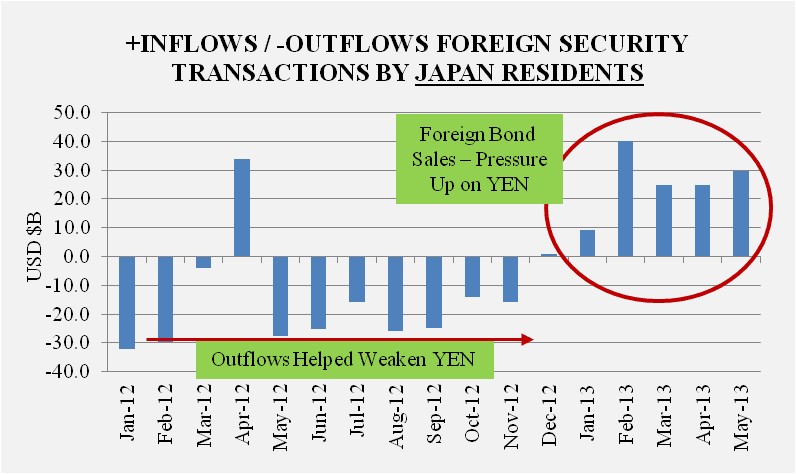 In the year of 2012, Japanese residents bought over $200B in foreign bonds. The data does not reflect what percentage was US government or company bonds, but it was likely high. On the other hand, Japanese residents were net sellers of foreign stocks during 2012 by $25B. 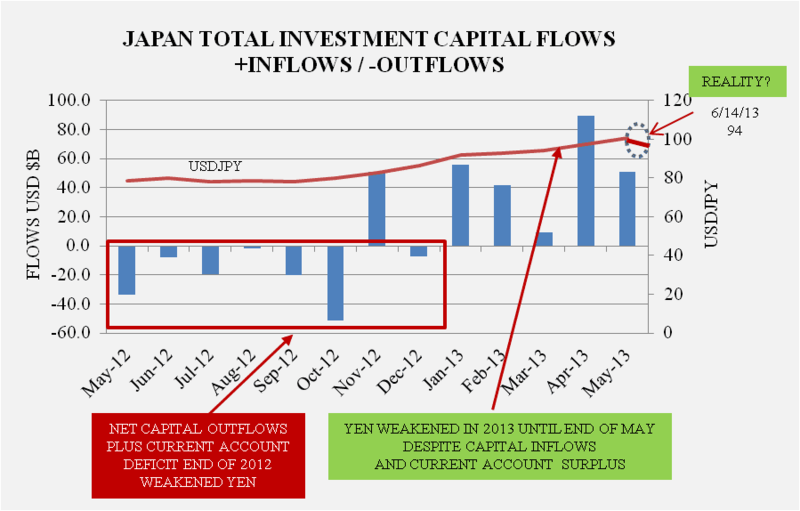 The overall outflow of capital from Japan in 2012 was supportive of weakening the YEN. Against the USD, this is what happened beginning slowly mid-year, and accelerating into year end. The interesting information in the data shows up in 2013. 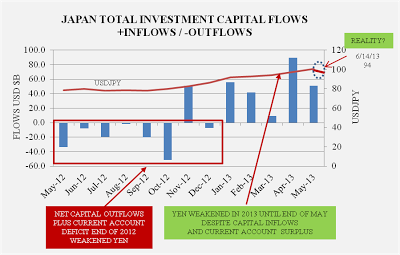 From the beginning of the year onward, Japanese residents have brought investment capital back into Japan. The sale of foreign equities continued. But more important information in the data is that the Japanese resident investors began to sell foreign bond investments. Seems like a rational investment move. The YEN has depreciated considerably, and to the extent the bonds were US based, interest rates are at all-time lows. It must look like a perfect time to sell high. The inflow of capital throughout the majority of months since 2012 has tended to put pressure on the Japanese YEN to rise. 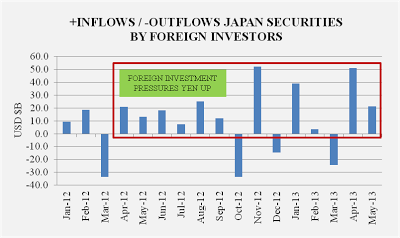 The data show that the majority of the capital has flowed into equities and out of Japanese bonds since October of 2012. 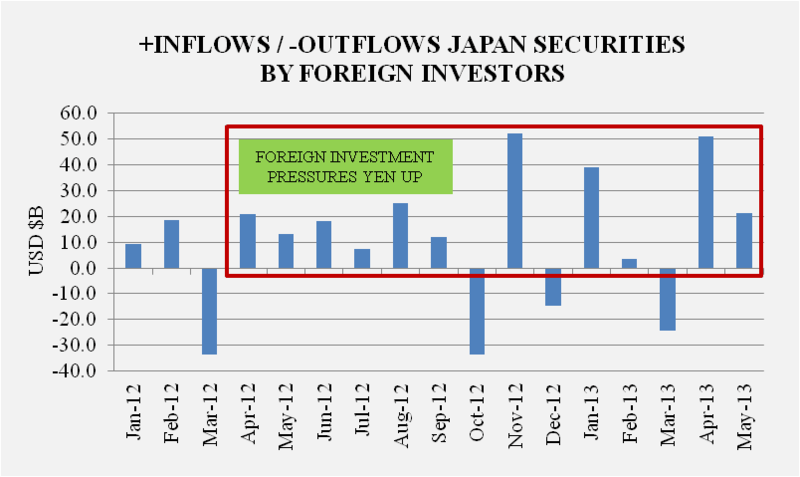 Prior to October 2012, the investment flow was primarily into Japanese bonds. The large outflow months in October 2012, December 2012 and March 2013 were all major withdraws of funds from foreigners from Money Market Accounts – money on the sidelines that went somewhere else. The trend in this data is very interesting. The prime method over the years by Japan and other Asian countries to weaken their currency relative to the USD is to purchase U.S. Treasury securities. U.S. treasuries and U.S. Government Mortgage backed securities have been a primary staple food in the carry-trade diet for years. But look at the data – the BOJ has been a net seller of U.S. Treasuries since the end of 2012. Whether this is willingly, or a result of called issues which have ended up on the Fed balance sheet, I do not know. But the trend is clear. 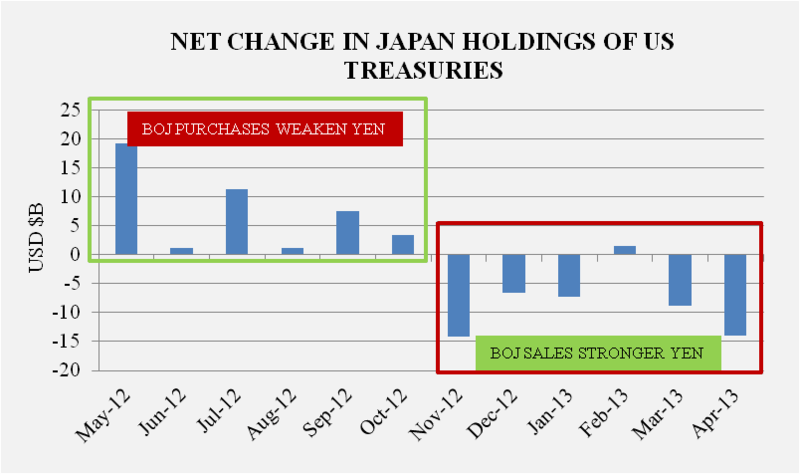 This data again should be putting pressure on the YEN to strengthen, not weaken. 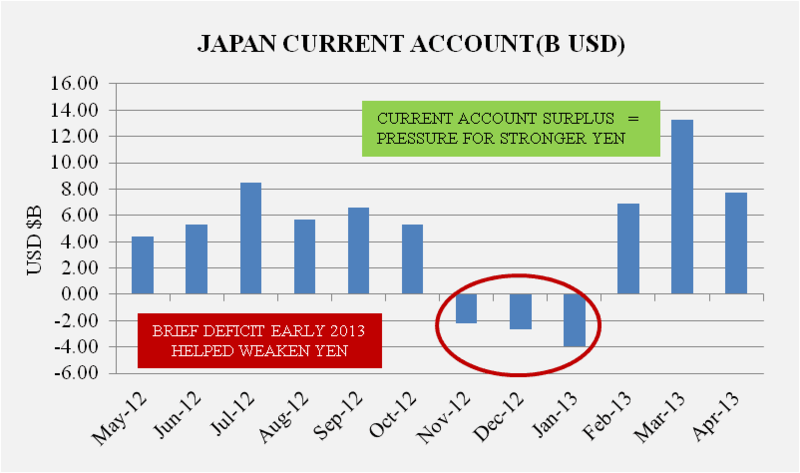 The last major influencing factor on the relative strength or weakness on the YEN that I examined is the Balance of Payments data for Japan over the past year – specifically the current account surplus / (deficit) by month. This data is in the chart below. It is not surprising that Japan, a major net exporter nation, has run a current account surplus a majority of the time over the past 12 months. Japan has an export driven economy and the trade balance surplus is what would be expected. There is one point in the chart which did peak my interest. At the end of 2012 and early 2013, Japan ran a current account deficit. This was the same time period that the YEN actually did begin to weaken. However, as we progressed into the spring of 2013, the current account again showed its usual surpluses. When all of the data are put together, the tendency of the YEN to strengthen versus the USD after its run up over 100 USDJPY becomes clearer. The chart below shows all the sources of investment capital flows over the past year into and out of Japan, including Japan Resident Foreign Investments, Foreign Investor Purchases of Japanese Investments and BOJ net purchases / sales of U.S. Treasuries. The chart also shows the value of the USDJPY over the past year. In Japan, the current account surplus must be accompanied by a net outflow of capital in order for the YEN not to have a strong tendency to rise against the USD. Also from the data, it is important to remember that Japan ran a current account deficit from Nov-Jan in the chart timeframe above (this data is not in the investment capital flow data on the chart – it is additive). When all of the data is combined the weakening of the YEN up to February of 2013 appears to have a good rational basis. However, since February actual data and the directional move in the currency relative to the USD have been very much out of synch. It is only speculation as to why this has happened. Obviously currency speculators and front-running carry-trade positions may be playing a roll. There was a tremendous expectation that because of Abe Shinzo’s announcement that the YEN carry trade would once again become that status quo relationship between the U.S. and Japanese financial markets. Many investors may have raced out in front of this trade by indirectly borrowing in YEN and buying the U.S. stock market. If this is the leveraged position of anyone’s portfolio today, they are really betting on “hope”, and looking for a set of crutches from Ben Bernanke this week – because the data which tracks real investment capital flows shows this position is busted. It actually looks more likely that the YEN may return to the level it traded last summer unless Ben Bernanke allows U.S. interest rates to rise dramatically – much more than they already have. Does Ben Bernanke have Carry Trade Crutches? How can Ben Bernanke prop up investors caught in a leveraged yen financed U.S. stock market position? It is not clear at this point he can. On Wednesday if the Fed Chairman announces a much slower pace of tapering in QE, he really is just promising to back-fill the increasing outflow of foreign investment in U.S. Treasury securities – some of which is Japanese based. Suppressing of U.S. interest rates at this point by continuing to make high levels of Treasury purchases as capital flows out of the U.S. will only work to strengthen the YEN – and weaken the USD. If the Fed announces that it will taper much quicker, this could serve as an eventual means to attract a stronger flow of funds back into the US to finance the U.S. government deficit as well as the on-going current account deficit. However, stronger tapering talk near-term is a big negative for the stock market. The information about what is happening from a Japanese market perspective is informative, if not outright concerning for the S&P500 investors taking new positions now. 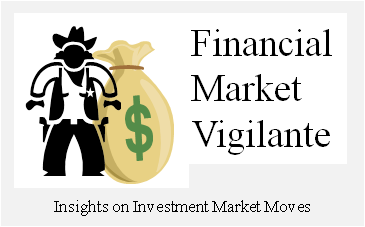 What is propping up the U.S. market right now is fear – fear that U.S. interest rates will rise. Japanese investors are exiting the bond markets worldwide even as their domestic policy supplies an even greater level of financial liquidity. Additionally, the Bank of Japan, and other worldwide central banks are lowering reserve levels of U.S. Treasury securities. Some of this activity may be a direct result of Jack Lew’s public statements on May 10th that Asian countries that enter the U.S. Treasury market to weaken their currency with purported “domestic stimulus expenditures” will be heavily scrutinized. Whatever the rational, the data reflect a cascade of pressure on the U.S. Treasury market to unwind. In reality, what was once a QE program to add domestic market liquidity to encourage investment and somehow promote job growth is turning into a revolving facility to off-set foreign sales of Treasury bonds. The Fed’s $85B a month budget may not be enough to cover the total outflow which might be encountered if the QE program continues. I track the foreign purchases of U.S. Treasuries, which is currently at a near all-time high of 47.5% on the Financial Calculus web-site. The April release of the foreign purchases was interesting. It showed a 1% down-tick in relative foreign positions - with many countries in Europe as well as Japan being the sellers. The outflow of funds in this fashion from foreign investment usually does not end well for the US stock market if it continues for any length of time. In the time frames over the past 50 years where there has been a net outflow of U.S. Treasury bond investments by foreigners, the most significant downward change happened in late 1999 end into the year 2000. This move preceded a sharp move downward in the stock market. A similar movement of foreign investment happened in 1973-74. With the precariously high level of foreign investment today, this issue is the number one specter, in my opinion that is hanging over the market. My advice at this point is that the Japanese resident investors seem to be taking the most rational approach to investing at this point. Reduce bonds and equities positions, re-trench and wait for a better entry point. In other words, hold not cash and cash equivalent positions in your portfolio. Ben Bernanke is going to have to raise rates, and also provide a slow reversal of QE. The exodus of capital out of U.S. Treasuries is not likely to change until there is a clear break-down in the S&P500. The magnitude of the cascading of losses which will happen as the rates increase is the real unknown – but it is very unlikely that given why rates are rising – exodus of foreign capital from U.S. Treasuries - that hiding out in the stock market should be considered a place of safety until the actual rate adjustment process forces the reversal of the recent run-up.